This is an isometric representation of a house full of traps. The place is perfect for a mafia boss, a paranoid noble or wizard, and any other person who wishes to keep something secret at all costs. You’ll see there’s plenty of traps, the place is designed to protect the safe box in the basement. What’s hiding inside? Only you know. There’s also a body impaled on the spikes at the start of the stairs, who is that and why he came to snoop can also be a plot point. 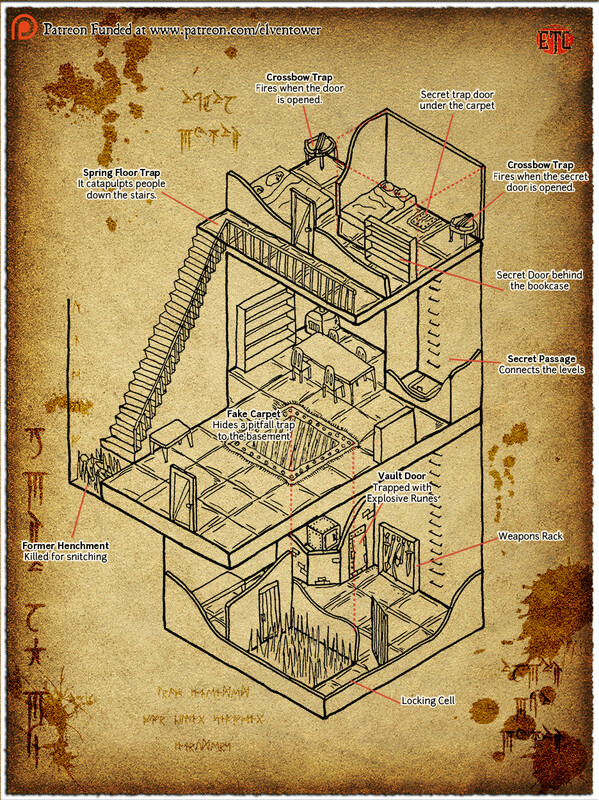 For Patrons Only –There’s an unlabeled version of the map for easy repurposing and also some black and white versions for friendly printing. Hope you guys are having an awesome weekend, thanks for your continuing support, I am ever grateful to you.